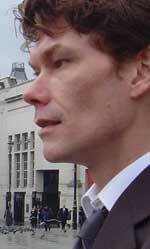 Gary McKinnon (born 10 February 1966) is a Scottish systems administrator and hacker who was accused in 2002 of perpetrating the “biggest military computer hack of all time,” although McKinnon himself – who has a diagnosis of Asperger’s Syndrome – states that he was merely looking for evidence of free energy suppression and a cover-up of UFO activity and other technologies potentially useful to the public. On 16 October 2012, after a series of legal proceedings in Britain, Home Secretary Theresa May withdrew her extradition order to the United States. McKinnon is accused of hacking into 97 United States military and NASA computers over a 13-month period between February 2001 and March 2002, at his girlfriend’s aunt’s house in London, using the name ‘Solo’. The US authorities claim he deleted critical files from operating systems, which shut down the United States Army’s Military District of Washington network of 2,000 computers for 24 hours. McKinnon also posted a notice on the military’s website: “Your security is crap”. After the September 11 attacks in 2001, he deleted weapons logs at the Earle Naval Weapons Station, rendering its network of 300 computers inoperable and paralyzing munitions supply deliveries for the US Navy‘s Atlantic Fleet. McKinnon is also accused of copying data, account files and passwords onto his own computer. US authorities claim the cost of tracking and correcting the problems he caused was over $700,000. McKinnon was first interviewed by police on 19 March 2002. After this interview, his computer was seized by the authorities. He was interviewed again on 8 August 2002, this time by the UK National Hi-Tech Crime Unit (NHTCU). In November 2002, McKinnon was indicted by a federal grand jury in the Eastern District of Virginia. The indictment contained seven counts of computer-related crime, each of which carried a potential ten-year jail sentence. McKinnon remained at liberty without restriction for three years until June 2005 (until after the UK enacted the Extradition Act 2003, which implemented the 2003 extradition treaty with the United States wherein the United States did not need to provide contestable evidence), when he became subject to bail conditions including a requirement to sign in at his local police station every evening and to remain at his home address at night. If extradited to the US and charged, McKinnon would face up to 70 years in jail. He has expressed fears that he could be sent to Guantanamo Bay. Representing McKinnon in the House of Lords on 16 June 2008, barristers told the Law Lords that the prosecutors had said McKinnon faced a possible 8–10 years in jail per count if he contested the charges (there were seven counts) without any chance of repatriation, but only 37–46 months if he co-operated and went voluntarily to the United States. U.S.-style plea bargains are not a part of English jurisprudence (although it is standard practice to reduce the sentence by one-third for a defendant who pleads guilty) and McKinnon’s lawyers contended that in effect this was intimidation to force McKinnon to waive his legal rights. McKinnon also claimed that he had been told that he could serve part of his sentence in the UK if he co-operated. He rejected the offer because the Americans would not guarantee these concessions. The House of Lords rejected this argument, with the lead judgement (of Lord Brown of Eaton-under-Heywood) holding that “the difference between the American system and our own is not perhaps so stark as [McKinnon]’s argument suggests” and that extradition proceedings should “accommodate legal and cultural differences between the legal systems of the many foreign friendly states with whom the UK has entered into reciprocal extradition arrangements”. On 23 January 2009, McKinnon won permission from the High Court to apply for a judicial review against his extradition. On 31 July 2009, the High Court announced that McKinnon had lost this appeal. McKinnon’s legal team, solicitor Karen Todner and barrister Ben Cooper, have applied for a judicial review into the Home Secretary’s rejection of medical evidence, which stated that, when he could easily be tried in the UK, it is unnecessary, cruel and inhumane to inflict the further stress of removing him from his homeland, his family and his medical support network. On 16 October 2012, Home Secretary Theresa May announced to the House of Commons that the extradition had been blocked, saying that “Mr McKinnon’s extradition would give rise to such a high risk of him ending his life that a decision to extradite would be incompatible with Mr McKinnon’s human rights.” She stated that the Director of Public Prosecutions would determine whether McKinnon should face trial before a British court. On 14 December, the DPP, Keir Starmer, announced that McKinnon would not be prosecuted in the United Kingdom, because of the difficulties involved in bringing a case against him when the evidence was in the United States. In August 2008, McKinnon was diagnosed by three of the world’s leading experts (Professor Simon Baron-Cohen, Professor Jeremy Turk and Professor Thomas Bernie) as suffering from an autism spectrum disorder compounded with clinical depression. The Labour MP Denis MacShane, implied in July 2009 that the late diagnosis of McKinnon’s Asperger’s Syndrome was somehow a sham and for likening his case to that of Ernest Saunders‘s apparent Alzheimer’s disease, MacShane was criticised for his insensitivity by Michael White in The Guardian and John Scott, chairman of the Howard League for Penal Reform in Scotland, in The Herald found his comments disgraceful. McKinnon’s mother, Janis Sharp, claimed that he was suicidal and that he would not survive a U.S. prison incarceration. She has received support from psychiatrist Professor Jeremy Turk of St George’s Hospital, London, who said that suicide was now an “almost certain inevitability”. On 10 November 2009, Janis Sharp gave evidence before the Select Committee for Home Affairs of the UK Parliament. The Committee backed calls for the extradition to be halted because of McKinnon’s “precarious state of mental health” and called for a comprehensive review of the extradition treaty. In January 2010 Mr Justice Mitting granted McKinnon a further judicial review of the decision of Home Secretary Alan Johnson to allow McKinnon’s extradition. Mitting distinguished two issues which were arguable, the first being whether Professor Turk’s opinion that McKinnon would certainly commit suicide if extradited means that the Home Secretary must refuse extradition under section 6 of the Human Rights Act 1998 (which prevents a public authority from acting in a way incompatible with convention rights). The second was whether Professor Turk’s opinion was a fundamental change to the circumstances that the courts had previously considered and ruled upon. Mitting ruled that if the answer to both questions was “Yes”, then it was arguable that it would be unlawful to allow the extradition. In early November 2008, a total of 80 British MPs signed an Early Day Motion calling for any custodial sentence imposed by an American court to be served in a prison in the UK. On 15 July 2009, many of them voted in Parliament against a review of the extradition treaty. In mid-November 2008, the rock group Marillion announced that it was ready to participate in a benefit concert in support of Gary McKinnon’s struggle to avoid extradition to United States. The organiser of the planned event is Ross Hemsworth, an English radio host. No date has been set yet. Many have now voiced their support, including Sting, Trudie Styler, Julie Christie, David Gilmour, Graham Nash, Peter Gabriel, The Proclaimers, Bob Geldof, Chrissie Hynde, David Cameron, Boris Johnson (Mayor of London), Stephen Fry, Jonathan Ross, Terry Waite, Tony Benn, Chris Huhne, Lord Carlile, the Conservative Party, the Liberal Democrats, the Green Party of England and Wales, the National Autistic Society, Liberty, and many others. All of these propose that, at least, he should be tried in the UK. In August 2009, Scottish Newspaper The Herald reported that Scots entrepreneur Luke Heron would pay £100,000 towards McKinnon’s legal costs in the event he was extradited to the US. In a further article in The Herald, Joseph Gutheinz, Jr., a retired NASA Office of Inspector General Senior Special Agent, voiced his support for Gary McKinnon. Gutheinz, who is also an American criminal defence attorney and former Member of the Texas Criminal Justice Advisory Committee on Offenders with Medical and Mental Impairments, said that he feared Gary McKinnon would not find justice in the USA, because “the American judicial system turns a blind eye towards the needs of the mentally ill”. Web and print media across the UK were critical of the extradition. The The Daily Mail was amongst many tabloid newspapers who ran a campaign to prevent Gary McKinnon’s extradition to the U.S.
Janis Sharp, McKinnon’s mother, stood as an independent candidate in the 2010 General Election in Blackburn in protest against the sitting Labour MP Jack Straw, who was Foreign Secretary when the extradition treaty was agreed. She finished last out of eight candidates with 0.38% of the vote. On 20 July 2010 Tom Bradby, ITN political editor, raised the Gary McKinnon issue with U.S. President Barack Obama and Prime Minister David Cameron in a joint White House press conference who responded that they have discussed it and are working to find an ‘appropriate solution’. In August 2009, Pink Floyd‘s David Gilmour released an online single, “Chicago – Change the World”, on which he sang and played guitar, bass and keyboards, to promote awareness of McKinnon’s plight. A re-titled cover of the Graham Nash song “Chicago“, it featured Chrissie Hynde and Bob Geldof, plus McKinnon himself. It was produced by long-time Pink Floyd collaborator Chris Thomas and was made with Nash’s support. A video was also posted online. McKinnon has admitted in many public statements that he obtained unauthorised access to computer systems in the United States including those mentioned in the United States indictment. He claims his motivation, drawn from a statement made before the Washington Press Club on 9 May 2001 by “The Disclosure Project“, was to find evidence of UFOs, antigravity technology, and the suppression of “free energy”, all of which he claims to have proven through his actions. In an interview televised on the BBC‘s Click programme, McKinnon claimed that he was able to get into the military’s networks simply by using a Perl script that searched for blank passwords; in other words his report suggests that there were computers on these networks with the default passwords active. In his interview with the BBC, he also claimed of “The Disclosure Project” that “they are some very credible, relied-upon people, all saying yes, there is UFO technology, there’s anti-gravity, there’s free energy, and it’s extraterrestrial in origin and [they’ve] captured spacecraft and reverse engineered it.” He said he investigated a NASA photographic expert’s claim that at the Johnson Space Center‘s Building 8, images were regularly cleaned of evidence of UFO craft, and confirmed this, comparing the raw originals with the “processed” images. He claimed to have viewed a detailed image of “something not man-made” and “cigar shaped” floating above the northern hemisphere, and assuming his viewing would be undisrupted owing to the hour, he did not think of capturing the image because he was “bedazzled”, and therefore did not think of securing it with the screen capture function in the software at the point when his connection was interrupted. In 2006, a Freedom of Information Act request was filed with NASA for all documents pertaining to Gary McKinnon. NASA’s documents consisted of printed news articles from the Slashdot site, but no other related documents. This is consistent with NASA employees browsing internet articles about Gary McKinnon; the records of such browsing activity are in the public domain. The FOIA documents have been uploaded to the Internet for review, and can be downloaded. On 12 December 2007, BBC Radio 4 broadcast a 45-minute radio play about the case, The McKinnon Extradition by John Fletcher. It was re-broadcast on 2 September 2008. It was directed by Pete Atkin and produced by David Morley.